Apple began seeding iOS 8.2 to compatible devices worldwide. The Cupertino giant’s CEO Tim Cook announced the new firmware’s availability during the company’s Spring Forward event. The most important change that iOS 8.2 brings is support for Apple Watch via a dedicated application. Full pricing and details on Cupertino’s smartwatch were revealed today. A brand new Activity application for viewing fitness data from the Apple Watch is also on board. The functionality is available on Apple iPhone 5 and later models. The Health app in iOS has been improved as well. You can now change various measurement units and visualize workout sessions from third-party apps. Stability has been improved throughout the suite as well. A number of enhancements for Apple Mail, Maps, and Music among others have also been included. 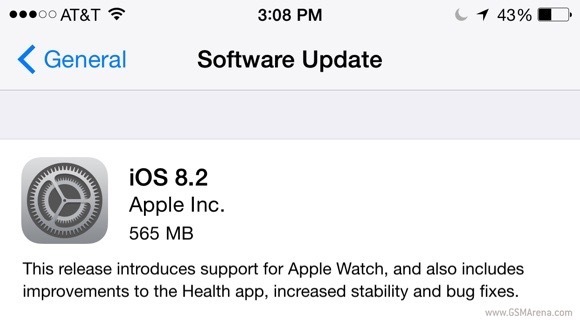 Apple iOS 8.2 is a considerably sized update at 565MB. To access the update on your device, head over to its settings menu. Make sure that your battery has at least 50% charge before you install the new firmware.